They are too flat and not comfortable at all. 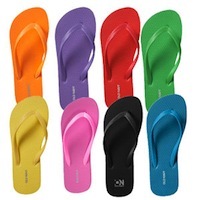 My 11 year old daughter loves them becasue they are cheap and she can own every color flip flop. Cheap simple durable. Great to have in all colors to match every outfit! Love because of colors, they last, and are actually pretty comfortable! I do not know about wearing them if you are going to walk 5+ miles, but for normal walking they are great! These are the best regular flip flops. I have 3 pairs of them. They're cheap, cute and comfortable. They don't break easily apart like other cheaper brands. They are very popular, and have been for years because of old navy. I have been wearing them for years. I like this product. They are good when your getting out of the pool or just around the house. But if your walking for a long period of time they are not comfortable. I always try to pick up a few pairs of Old Navy flip flops when they are on sale. I have pairs that I have owned for years now and they are still in good shape. I like that there are lots of colors to choice from and how simple the flip flops are. I usually get these around vacation time. because of the big color selection, to match my outfits and bathing suits. They aren't the most comfortable flip flops, so I don't wear them with my everyday attire. I love old navy flip flops they actually last, and they are good priced!